For all arm-chair Christian Horners out there and for those who have time and again mouthed expletives to Stefano Domenicali, now is your chance to prove your worth as a Team Owner in Formula1. Yes, after losing HRT at the end of the 2012 Formula1 Season, the FIA has now floated a tender inviting potential buyers for a 12th Formula1 team from the 2015/16 seasons. If you could, should you actually bid? On this week’s episode of the Inside Line F1 Podcast, Rishi and I try and answer exactly that; the trials and tribulations one will need to endure before you get to decide who will be your number 2 driver or before you decide which driver will pit when and for which tyre compound; yes, basically the hard work before the fun starts! And like always, we ask a crucial question in this Formula1 Podcast: why would you buy a team in Formula1? Share your answers. Baby Schumi to have a baby…! And we try to do predict how Vettel’s baby will behave. The FIA announces a ‘pole position’ trophy. Namesake or Vettel-sake in this context? 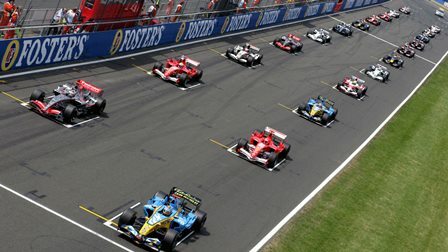 Points for pole position and fastest lap of the race, why can’t we bring a system used widely in junior formulae? We tell you which. If the FIA did want to ‘spice’ things up, we discuss what they could’ve actually done or still can do. A round up of the driver movements from the last week; glad to hear about Adrian Sutil! And could Jenson Button host the episode of the Inside Line F1 Podcast from the first test of the 2014 Formula1 Season? We leave you guessing! Permanent No. 1 in Formula1: Vettel or Schumi? The Inside Line Formula1 Podcast is produced and hosted by Rishi Kapoor and Kunal Shah. Follow us on Twitter and on our Soundcloud, Spreaker, MixCloud and YouTube channels.